He grew up mostly in New Orleans where he also went to college. He became an engineer and worked as such for a number of years. Bill became involved in Scientology in the beginning of the 60s. That is also when his interest in global affairs started to take of. On the first given chance Bill got a berth on a freighter sailing for England to join the mainstream of Scientology at the time. He arrived at Saint Hill in 65 and enrolled as a student in the Briefing Course. He was very excited about the whole thing and devoted all his energy to the subject from day one. The first time Bill met Hubbard was shortly after arriving at Saint Hill. He and a few other students had sneaked into the chapel to have an impromptu guitar jam session. Ron, having heard the sounds walked in and joined them. He borrowed a guitar and taught them a series of raunchy whole track pirate songs he remembered. He had been working as an engineer on the construction of Minuteman missile sites and other secret government projects, but started now to realize that this was’nt any way of dealing with the problems of the world. new students didn’t realize before afterwards to their amazement that they had met the founder of Scientology. Bill soon joined staff and was put in charge of Estates. He also worked as an auditor in that period after finishing his Class VII course. Later he became one of the first to become involved with the newly formed Sea Organization in early 1967. He became the chief engineer on the first ship, the Enchanter, and continued in a many different capacities. Many of his years in the Sea Org Bill functioned as captain on the flag ship, the Apollo. Hubbard awarded him the rank of Captain, an honor otherwise only bestowed on his own wife, Mary Sue. After that Bill was never known as anything else but simply ‘Captain Bill’. The Sea Org offered many adventures and Bill was in the midst of most of them. Hubbard was very impressed with Bill’s qualities as a missionaire. Given an difficult situation with all the odds against it, Bill would be one of his first choices to send out. Bill therefore completed an impressive amount of missions in many different environments. He has worked as a commanding officer of most of the major organizations at the time. There is no doubt that Bill Robertson was very instrumental in spearheading the subject time and time again. Captain Bill was the type of person who would charge ahead no matter what the opposition was. Of course that couldn’t always be done without casualties and he would often end up stepping on some toes. But in terms of getting the job done he earned a lot of respect. Hubbard granted him the title of “Kha-Khan”, meaning the forgiveness 10 times of the death penalty, which in the church means an SP declare. 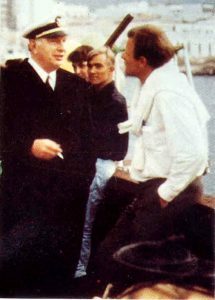 Bill used several of those ‘lives” in the course of his Sea Org career. In 1981, after Hubbard disappeared out of touch with the organization, Bill involved himself in finding out what was going wrong with the church. His working theory was that it had been infiltrated and taken over by government agents. He pursued this and found quite a lot of data to back it up. Bill didn’t hesitate long before he started to build up activities in the independent field. He moved to Europe and started an OT Committee to get independents moving on 4th Dynamic projects. From 85 on he started to concentrate on tech again. He formed a loose network of delivery centers collectively known as ‘Ron’s Org’. Today there are 15-20 centers across Europe in this network, the biggest independent delivery organization at this point. Training delivery terminals and producing technical materials Bill Robertson has been very instrumental in establishing a solid independent field in Europe. He developed an impressive series of advanced levels continuing the bridge that was previously available. A large amount of written materials, tapes, and videos now add to the pool of technology that exists. This includes the Sector 9 and Teegeeack books and a series of lectures and seminars covering basic tech as well as such subjects as telepathy and UFOs. Bill lived in various locations across Europe, including Germany, Spain and Switzerland.